This industrial duty super tough elevator bucket is manufactured from "Nyrim" which is a high-grade nylon/rubber reaction molding. These unique properties offer the elevator bucket the ability to withstand maximum resistance to impact and abrasion. Can be used with many abrasive and corrosive industrial materials, such as: AGGREGATES, CEMENT, GYPSUM, COAL, SAND, ETC. The "AD" elevator bucket can be used with elevator belting or chain. The reduced weight of the elevator bucket, compared to a steel fabricated type, enables extended chain life. 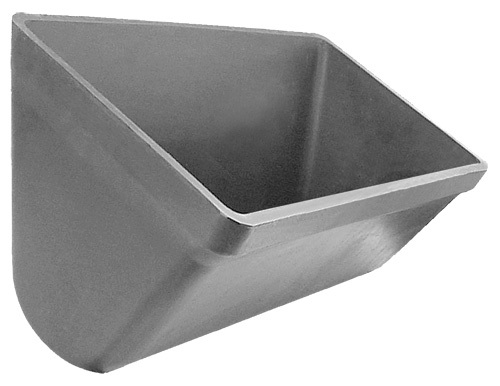 The "Nyrim" material is corrosion resistant which also allows for longer bucket life. The "AD" elevator bucket design allows for high capacity capabilities. Bolt holes drilled to customer specification. We supply buckets elevator chains on application, in which there are too many numerous style / types to list or even mention. Please contact 4B for further information.